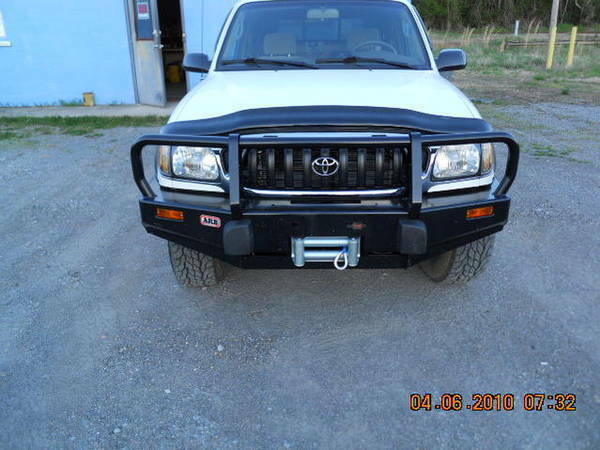 What should I do for a new bumper? Discussion in '2nd Gen. Tacomas (2005-2015)' started by dirtysouthtaco, Oct 16, 2010. This beautiful art work is courtsey of the Florida Fish and Wildlife Commision. I was backed into a parking spot at work and (caught on security camaras) 5 minutes after walking in FWC drove by towing a swamp buggy on a trailer and decided to remove my bumper. Im wondering what I should get now? I'm a fan of the Relentless Plate bumpers. I would go for a Relentless Fab one. By far the best looking bumper, imo. So are they paying for it? My tax dollars at work? if only you knew what your tax dollars paid for in my line of work..
Oh, I'm ex-Navy, I've seen plenty myself. I don't have a problem with them paying for it, they should. I have a problem with recklessness in my public servants. SJ I like that video, I saw pics of the relentless fabs but only saw stuff for the first gens, does anybody have pics of the second gen or a web site? Anybody know how much they are? Either a relentless fabbed bumper or an ARB IMO. How long does it take to get one Relentless? Im on the east coast? I would definitely go with the ARB Bull Bar. I have one and I absolutely love it. If you mess that thing up your gonna have to hit something really solid and really hard. I hit a deer two weeks after my bumper was put on at 50mph. By the sound of it I thought it would be bent all up. When it got daylight, No dents at all. Nice bumpers and they mount really well and are very sturdy on the truck. Lead time is under 2 weeks, and shipping is around 12-14 days to get to the east coast. PM me if you have any specific questions or would like to discuss ordering one.